Matthew Jones knows a thing or two about making great bread. He should do – a champion for English baking – he has been making it for over 25 years and has loved every minute of it! Between 1986 and 1998 he honed his craft working alongside well known names such as Shaun Hill, Simon Hopkinson and John Torode in restaurants including Bibendum, Pont de la Tour, Quaglino’s and finally as Head Pastry and Bakery Chef at Mezzo. In 1999 Matthew opened Flour Power City Bakery in Hoxton. It was a huge success serving over 100 customers daily across London and yet more at their second shop in Kent. Over the following 12 years Flour Power City gained a reputation for excellence, featuring regularly in prestigious food journals as well as on prime time TV. 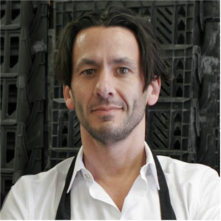 Throughout this time Matthew built a strong and ongoing relationship with Borough Market, Britain’s most renowned food market. Doing what he loves best, baking and selling his bread to an enthusiastic public, Matthew has not only fulfilled this goal by creating Bread Ahead, but has also found a place to teach baking to a new generation of enthusiasts. Integrated into the working bakery, the Bakery School teaches a wide variety of baking and pastry skills to both established bakers with an appetite for genuine traditional baking and an ever increasing army of young men and women keen to learn the secrets behind our favourite food.